Lately I've been focusing on filling my wardrobe with closet staples. Pieces that are timeless, versatile and interchangeable with the seasons. It's hard to do when every store is filled with pretty pastel and floral dresses that never fail to catch my eye, but when you remember that these pieces can accent the more seasonal items it definitely makes it easier. I've been doing pretty well building up my wardrobe and wanted to share what I find to be five staples items that every closet needs. Let me know if you agree with these pieces and where you splurge! Or if I'm missing any. 1. White Blouse- I had been on the hunt for a soft, not too fitting white blouse for so long. I came across this boyfriend style blouse at Old Navy and it was exactly what I was looking for. I love that it has slits in the sides and can take me from work to event with no change needed. Tuck it in a skirt, wear it under a sweater with the collar popping out or simply wear it on it's on. 2. 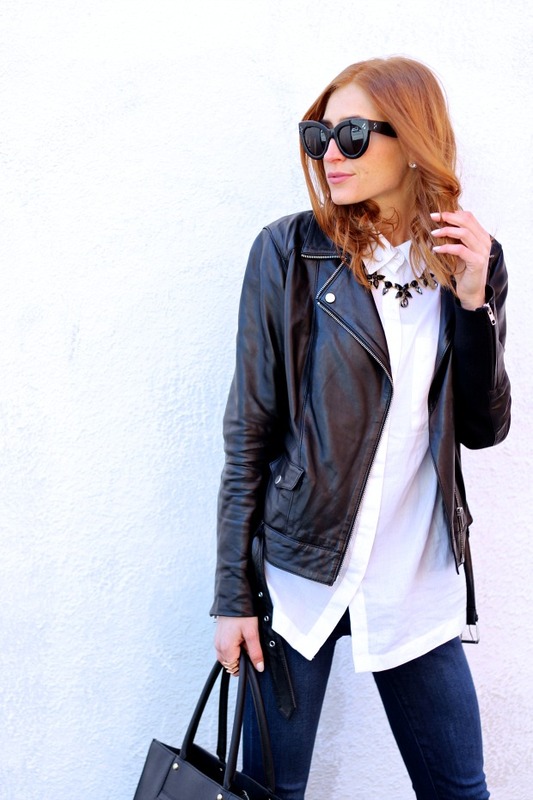 Leather Jacket- Leather jackets are a closet splurge, but an essential. And the right one can last year you over ten years (just ask my mom). When you find one you love-- that fits like a glove, is made with breathable material, and expresses the right amount of rocker chic vibes without looking like a biker-- you know you are set. This jacket took me a few years to come by but has definitely proven valuable as I pair it with everything from lace skirts, skinny jeans, and floral dresses. 3. Skinny Jeans- I know we all have a variety of jeans-- the boyfriend, the distressed, the high waisted-- but a dark washed pair of skinny jeans without rips is a closet staple for me. They can be worn to work on casual Fridays, be dressed up, or dressed down for any event. I recently picked these up at American Eagle when they were having a BOGO sale (along with this pair) and am so glad I decided to go with this classic style as I have found myself relying on them more and more. 4. 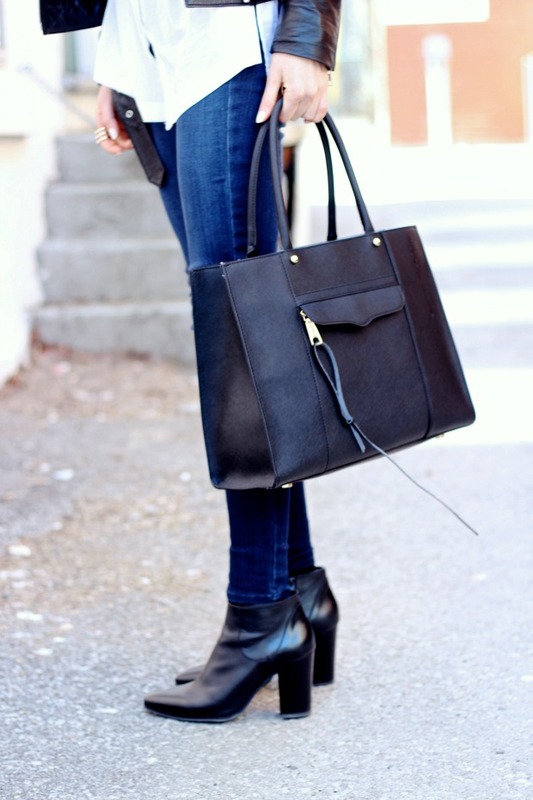 Black Structured Bag- Another item to splurge on to ensure quality. My Rebecca Minkoff tote takes me from morning to night, work to event, and fits a copious amount of paraphernalia that one may or may not need on the daily (here's looking at you bulk barn coupons and 2 bottles of Essie nail polish). A structured bag is timeless and essential. 5. Black Booties- Again, I had been on the hunt for a pair of black, pointy-toe boots, with just the right amount of heel height and that did not resemble cowboy boots in any way. I know it's April, and basically time to put them away, but how did I do? I loved these Zara booties instantly and am so glad to finally have found an alternate to my fatigued Sam Edelman Pettys. Booties pair with everything from pants, skirts and dresses and when you find the right pair it's like everything clicks. Am I right? Remember-- timeless over transient and classic over momentary. Do these tips help? What are some of your closet staples? Am I missing any essentials? Shout-out to the lovely Jackie from Something About That for braving the cold and snapping these shots. Amazing style! I love the look and the details are just perfect! I'm totally with you on these 5 staples. They are so versatile and take no effort to put together. Also, it's the quickest formula to instant chic, as you prove with these pictures. You look beautiful! I totally agree with your wardrobe staples Gabriella! Amazing score on the white blouse, it's perfect! Yes! Love all of these staples. You can never have enough of these, although the white shirt, I am struggling to find good ones. I just never like the material they are. Looking fab as always! Perfect skinny jeans. WOW! Love this look! Thanks for the inspiration! I agree 100% with your list of 5 staples...but can you believe I don't even OWN a white blouse? I think I'll have to pop on over to Old Navy, because the problem I find with so many similar options is that they're awkward and short on me. These are all really great staples to have! Perfect list of essentials and you look so chic and cool. I need to break down and buy a real leather jacket. Gorgeous outfit. I love the jacket. I could certainly use a great white blouse and some black booties. Great list! Cute outfit! I love your jacket and purse! I like this specific plus the Excellent report on requirements so you search consequently elegant along with neat. I want to stop working and buying a true natural leather coat.